Headlining the event is Emily Dreyfuss, Senior Writer for WIRED Magazine, speaking about the omnipresence of technology in our lives. 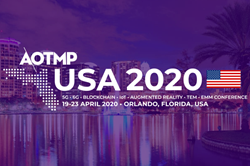 AOTMP®, a worldwide leader in telecom, mobility, and IT management best practices and research, has announced its fourteenth annual flagship conference in Orlando, Florida from April 19-23, 2020. This reinvented conference experience features unique peer-to-peer networking with enterprises and vendors across the globe. Headlining the event is Emily Dreyfuss, Senior Writer for WIRED Magazine, speaking about the omnipresence of technology in our lives. In addition, the conference intends to ignite new frontiers in the industry by discussing 5G/6G next generation wireless technologies, Internet of Things (IoT) technologies, blockchain, and augmented reality. AOTMP® USA 2020 will also have its familiar telecom expense management and enterprise mobility management programming tracks. AOTMP® is a worldwide leader in telecom, mobility, and IT management best practices and research. For over two decades, it has been on the forefront of telecommunications, mobility, and information technology management with its comprehensive suite of solutions including AOTMP® University, its Research & Advisory division, the AOTMP® Industry Council, and its baseline & validation services. With its proprietary and patented Efficiency First® Framework, it applies best practices to telecom, mobility, and information technology environments. Powered by years of analytics and data, AOTMP® continues to make strides as an authority in the industry.